Annah Billups is a tease. We learn that in the first few pages of the story, as she awaits her date for the evening. It turns out she has made two, and she is leaving with the first person who shows up. Along the way, we learn more about Annah, her scientist father, and her potentially fictional sister, Ginger. As we follow Annah on her date, we meet a number of characters, from bulldogs to pigeons to passersby, and in an experimental storytelling twist, they become narrators for brief windows of time. Many philosophical questions, about identity, emotions, love, and reality are tossed around as we try to keep up with the flow of the evening. This tale was originally published as a webcomic on Top Shelf 2.0. 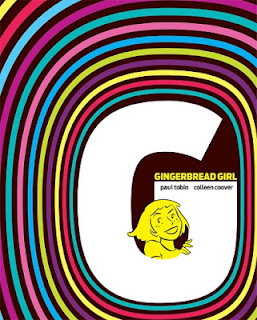 It is the product of husband/wife creative team Paul Tobin and Colleen Coover. They have collaborated in the past on Banana Sunday, an all-ages graphic novel about a young woman who becomes the guardian for three monkeys. They are also both memebers of the Periscope Studio. Tobin has written a number of comics, notably many entries in the Marvel Adventures series. He has also written a novel about superheroes, Prepare to Die! Coover has also written and drawn the adult comic book series Small Favors, which has a strong following, and a number of short works for Marvel Comics. 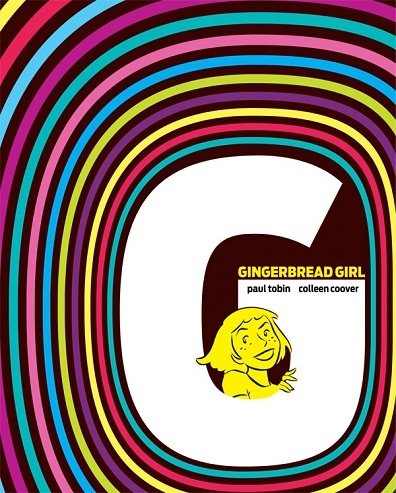 Tobin and Coover both speak more about Gingerbread Girl in this interview. Reviews of this book I have seen have been very positive. Comics Should Be Good's Greg Burgas called it "so beautiful and haunting" and added that it is "a fantastic comic that looks great." Phil Oldham described the book as "thought provoking, interesting and fun." Comicsgirl called the book a "true collaboration" between Coover's "cute and appealing" characters and Tobin's "playful" dialogue. I agree that this story displays both creators' strengths. At first I found the shifting narrators jarring, then something of a novelty, and by the end of the book I had adjusted to them. I felt in a narrative where the reader is constantly seeking to dispel a cloud of mystery that the blend of authoritative information and (un)reliable narrators contributed to the book's tone in an interesting, inventive way. At the end there are multiple possibilities we can believe and no indications which are "real." Finally, I realize the entire story is available online but I feel the book is an attractive collection, well worth owning. Previews, reviews, and other links are available here from the book's publisher, Top Shelf. 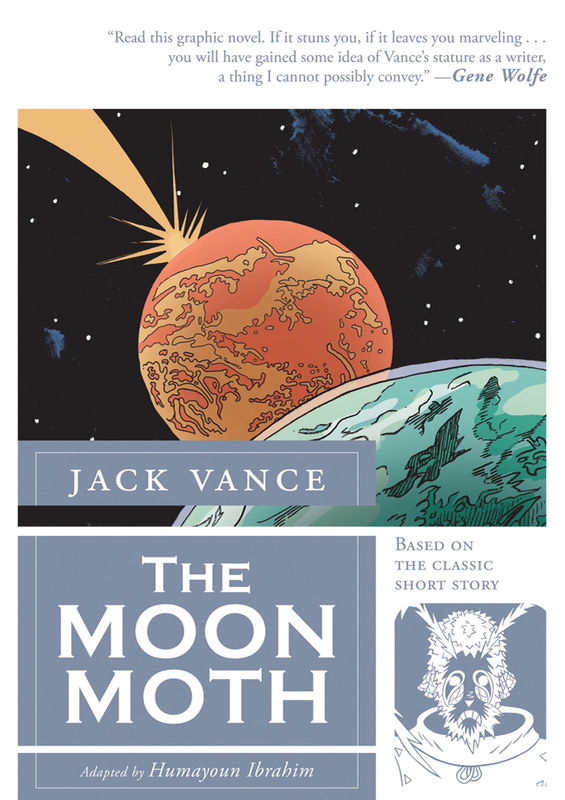 The Moon Moth is an interesting, intriguing read, a murder mystery wrapped in science fiction trappings. The plot revolves around Edwer Thissell, the new consul to the planet Sirene from Earth. He has studied the Sirenese customs and is learning how to negotiate their complex social structure where everyone wears masks, people communicate through musical instruments, and the only currency is based on status, honor, and prestige. On Sirene, to offend a person means courting punishment and almost certain death. Thissell manages to offend fewer people as the story goes on, wearing a lowly mask of the moon moth to reflect his low social standing. We also learn that he has is involved in solving a murder, which is no easy task on a world where everyone wears a mask. 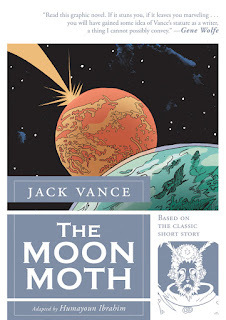 The author of the original short story, Jack Vance, is a mystery, science fiction, and fantasy writer who has been publishing work since 1945. He is well respected and has won major awards such as the Hugo and the Nebula as well as being named a Science Fiction & Fantasy Writers of America Grand Master in 1997. Humayoun Ibrahim is a freelance illustrator and cartoonist, and this is his first graphic novel.I felt that the illustrations were brilliant and gorgeous and that the pacing of the story was snappy and fast-moving. This is a fine debut. Reviews I have seen thus far have been very positive. John Hogan called this book a good introduction to Vance's work for new readers, calling this version "colorfully vivid as it comes to life in a reverentially cartoony form." Mark Frauenfelder wrote on boingboing that Ibrahim, like Vance, was "able to create very weird, but completely believable, worlds, and write about them in such a way that you feel you are in them." Daniel Elkin summed up, "This is a wonderful story which is certainly augmented by its presentation as a graphic novel." You can read the original short story, published in 1961, here. Previews and more information are available here from First Second. When faced with the fact that their friends or neighbors are murderers, we often hear people on the news say things like, "I had no idea. He mostly kept to himself and seemed like a nice man..." The author of this book used to joke that his high school acquaintance Jeff probably turned into one. This book treads a fine line, making us feel some empathy for an adolescent who would go on to be a serial killer, Jeffrey Dahmer. Using copious news stories, investigation notes, and interviews as a guide, this graphic novel delves into his adolescence, showing how a world of childish antics, pranks, strange fascinations, casual alcoholism, and family strife could lead to madness. The author is not asking the reader to feel sorry for Dahmer; he is merely documenting what happened. As he writes very clearly in the introduction, "Once Dahmer kills, however -- and I can't stress this enough -- my sympathy for him ends." Derf Backderf, the Eisner-nominated creator of this graphic novel did indeed graduate high school with Dahmer. He has been a cartoonist for more than two decades now, and he has also published the graphic novel Punk Rock & Trailer Parks, the comic memoir Trashed, and a 24-page comic book also called My Friend Dahmer that is something of a draft for this book. He talks more about his work on this volume in this interview. I have been a fan of Derf for decades now, first reading his comic strip The City in the Boston Phoenix while I was in college, and I have never noticed until now how his art style is so reminiscent of Spain Rodriguez's. That is not a bad thing, in my book, because the mix of staid realism with cartoonish faces, bodies, and postures plays to great effect here. The exaggerated grimaces of Dahmer imitating seizures for laughs, the dark moments with faces hidden in shadows, and the generally blank demeanors of the majority of people in the book make for great contrasting scenes where emotion and sensations come through. Not only do we get a strong sense of the characters but also the geography, with its claustrophobic woods and overwhelmingly hilly roads. Derf also used pacing to great effect in the book. The first few pages, with a telegraphed image of Jeff walking on the side of a street and coming upon a roadkill, really set an ominous, borderline quirky tone for the story. There are a couple of other sequences, when he takes a neighborhood dog to his private spot in the woods and when he picks up a hitchhiker later in the book, that are quite deliciously tense and suspenseful. Every event and scene deliberately moves toward a dark, inevitable end, and even though I knew how it would end I still thought the journey this book took me on was compelling and very affecting. The scariest part of the book (and there are several tense sections) for me was just how mundane and additive Dahmer's descent into madness and depravity was. He was not an outcast, mostly a joker on the fringes of class who was not really friends with anyone. Add to that he felt he had to hide and repress his homosexuality in a time and place with little chance of acceptance. He turned to alcohol, which was not so out of place in the more lax attitude toward substances and the lower drinking ages of the 1970s. That no one got close enough to him to notice how much his family life was affecting him is horrific and yet utterly understandable; most people are uncomfortable sticking their noses into others' business. Yet somehow all of these factors combined to lead into a deadly, terrible, and unthinkable series of events. Reviews I have read of this book have been very positive. The Cleveland Plain Dealer's Karen Sandstrom wrote that the power of this graphic novel is that it "allows the reader to mourn and pity the killer's own wasted life while never losing sight of who's to blame for what he became." The Comic Journal's Brandon Soderberg called it "the definitive piece of literature on the notorious murderer" and added that it is "also about what it’s like to be 16, self-involved, and lack the faculties to empathize." Time's Lev Grossman wrote of the power of the book, "It’s a great thing when you feel that you recognize yourself, deeply and movingly, in a work of literature. 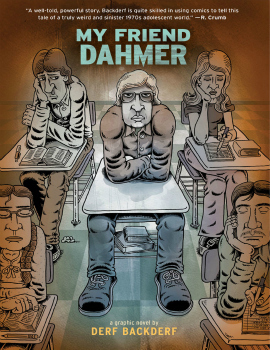 It’s kind of unnerving when that work of literature is a graphic novel called My Friend Dahmer." Kirkus Reviews gushed in a starred review, calling it "an exemplary demonstration of the transformative possibilities of graphic narrative." This book was published by Abram ComicArts. Here is a preview available from The Beat. This book is dedicated to the creators' brothers who became doctors. The dedication is apt because Level Up is about the pressure some children feel to live up to their parents' expectations. Dennis Ouyang, the protagonist, fell in love with video games at age 6, but he was never allowed to play them or get an allowance to squander on arcade games. His father tells him that he will have to "eat much bitterness" in this life, especially because he wants his son to become a doctor. Dennis hints for months that he wants an NES for his birthday, but instead gets a chemistry set. After his father dies, he throws himself into gameplaying, which wreaks havoc on his grades. Threatened with expulsion from college, he is visited by four angels who intervene. Eventually in med school, Dennis finds himself questioning if this is the career path for him. As with Yang's other works, this book blurs the lines between fantasy and reality in a magical realistic manner. Metaphors about religion and life mix with video game images and conventions in surprising and almost logical fashion, making for a narrative that is compelling in multiple ways. The ambiguity and uneasy feelings that come from growing up and figuring out what to do with one's life are portrayed masterfully. At times, friendly faces seem sinister and vice versa. Pham's art is deceptively simple looking, but conveys much emotion and meaning. Although it does not pack the wallop of American Born Chinese, Level Up still pays off well as an expressive story. This book is a collaboration between writer Yang and artist Pham. Gene Luen Yang is an educator and an established, award winning graphic novelist who has published American Born Chinese, The Eternal Smile, and Prime Baby. Thien Pham is a high school teacher and an up and coming graphic novelist. He has few other credits as yet, but he has a forthcoming solo graphic novel called Sumo set to be released in December. This article touches on both creators' work on this book. 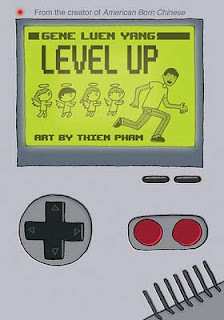 Level Up was selected a New York Times Notable Children's Book (Young Adult) for 2011. Reviews I have seen thus far have been on the positive side. Nicole Wong remarked on the strong manner the book conveys meaning visually, "Complex relationships and personalities are sketched out with subtlety and nuance, through meaningful hand-drawn facial expressions and blank contemplative framed pauses." Mark Flanagan called the book "good" but not great and wrote that it "is a well-illustrated and universally appealing story, however I would like to have seen Yang delve more deeply into Dennis’ relationship with his medical school friends." Kirkus Reviews summed it up as "A piquant, multilayered coming-of-age fable for the wired generation." A preview and multiple other resources are provided here by Yang. The book's publisher, First Second, provides more resources and information, including reading group and discussion guides, here. This is not a happy book, let me tell you, but it has lots of likeable and interesting elements, including a scrappy, durable protagonist, coyote people, a plague, a ghost town, a crazy prospector, and an unlikely romance. 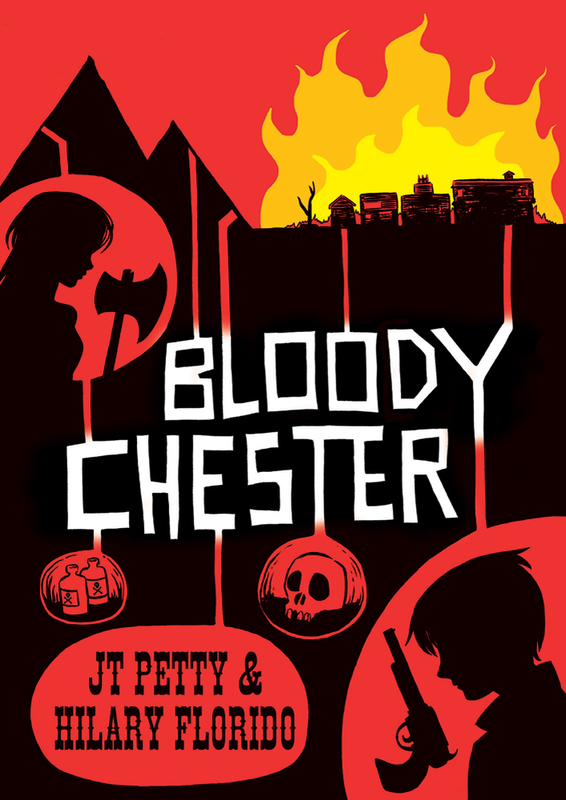 Bloody Chester is the main character, a young man named Chester Kates who is broke, is in constant trouble, and gets beat up a lot. He gets a lot of grief because he is pretty scrawny, and people tease him by calling him "Lady Kate." One day after getting out of jail he is hired by a Mr. Croghan to go to an abandoned town called Whale and burn it to the ground to make way for the coming railroad line, no questions asked. Seeing this paycheck as a way out of his cycle of woe, Chester takes him up on the offer. When he gets to the town, however, he finds it is not quite abandoned, though it is littered with bodies and haunted by eerie coyote men. 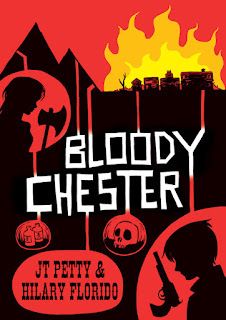 Bloody Chester is a collaboration between JT Petty and Hilary Florido, with colors provided by Hilary Sycamore. Petty is an author, film director, and video game writer who is probably best known for his horror works and the Tom Clancy's Splinter Cell video game. Florido is an up and coming artist, and this is her first graphic novel, though her mini-comics have been short-listed for the Best American Comics anthology series. Sycamore has done the coloring for multiple comics and graphic novels, many of them books from First Second. Reviews of the book I have read so far have been mixed but rather positive. Publishers Weekly called it "a creepy, complex, and surreal mystery that also shines as a character study." The Stumptown Trade Review wrote that it "attempts to be several things at once. It is a ghost story. It is a western. It is a mystery. And, for the most part, it works." The School Library Journal review commented that "the Western and the historical and the horror and the romance are pulled into a bouquet that is exquisite and more than simply palatable." On a contrary note, Diayll cautions that the book may be a little too intense for younger readers (it is suggested for ages 14 and up), which may or not be the case depending on the parent, and she liked the story very much, but she concluded that the book as a whole "fell flat on so many levels." Greg McElhatton called it "an odd book that’s hard to categorize" and added that "those looking for something a little darker, though, will probably appreciate the skill and thought" that went into the book. Personally speaking, I thought that the art was apt for the story, at once expressive and sensitive. Also, I felt that there was much going on, and sometimes information got lost in the process of my reading, but I feel that this book invites at least a few re-readings to catch all of the nuances and details. Although it is not for everyone (it has some swear words, racist slurs, and violence, not to mention the narrative itself is pretty bleak), I think that this book is a great piece of horror and suspense, and I appreciate the fact that it is not formulaic. There are not a lot of graphic novels I have seen like this one, and that speaks well of it and to the growing diversity of graphic novel fiction now being created. 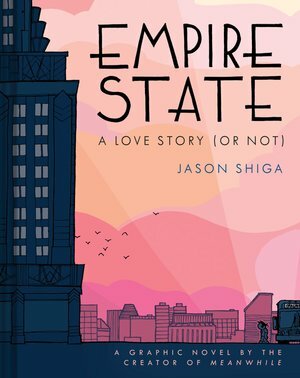 Jason Shiga has created a reputation for himself as an innovative comics maker. His mazes and puzzles have appeared in McSweeney's Quarterly and Nickelodeon Magazine. His book Meanwhile was a technical marvel, a choose-your-own-adventure graphic novel with thousands of tube possibilities. He has also drawn some memorable, creative, and challenging comics like Fleep and Book Hunter. Here he turns to a more mundane topic, trying to figure out what to do with one's life. This book has been pretty well reviewed thus far. Wired's Jonathan H. Liu wrote that "the book captures that feeling of growing up and taking on responsibilities — that time when you start to understand that you are an adult whether you’re ready or not." Nicole Wong noted that "Shiga’s style, known for incorporating puzzles and mysteries into his narrative style with wit and humor, is alive and well." The Comic Journal's Tucker Stone, who is a Shiga fan, was disappointed by the book, and wrote that he "failed to stick the landing (as well as the approach, the dismount, and everything in between)." But he is also hopeful Shiga will do better work in the future. Even though the story is rather conventional, this book does have its share of dynamic features. It uses a non-linear narrative, indicated by changes of coloring for the time period shifts. Shiga talks more about the creation of this book in this interview with John Hogan at the Graphic Novel Reporter. Empire State was published by Abrams ComicArts. There is a short preview of it available at Amazon.com. "Buy what won’t make you feel dirty." I very much enjoyed Tim Marchman's interview with Len Wein --and a handler(!) from DC Entertainment named Pam, I might add-- about the recent Before Watchmen project that has ignited a firestorm of comics controversy about creators' rights and corporate control. His talk with Wein lends a different angle on the topic, one from a long-time comics professional, and also puts a finer point on multiple arguments made about the situation. 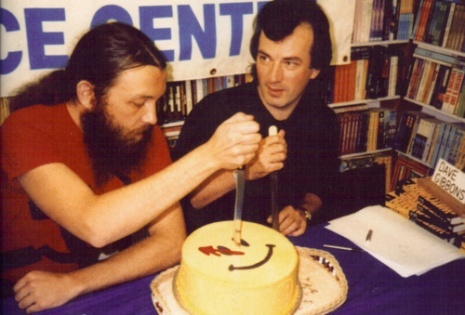 Alan Moore and Dave Gibbons carving up a cake!